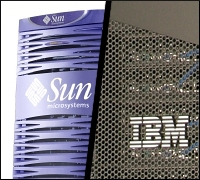 Looks like Sun Microsystems is open to renewing acquisition talks with International Business Machines (IBM) if the latter makes a stronger commitment to actually closing the deal, according to Bloomberg sources. Earlier this month, discussions over a potential takeover broke down when IBM withdrew its earlier $7 billion bid to buy Sun. Discussions have stalled, still according to the sources, and both companies are now waiting for the other to make a move. The information provided by the two unnamed sources implies that Sun withdrew exclusive negotations with IBM because there were apparently no guarantees that they would ultimately stick with the takeover if the companies encountered barriers such as an antitrust review. So basically Sun is saying: if you’re going to talk the talk, you’d better be prepared to walk the walk. Spokesmen from both companies declined to comment. Meanwhile, other potential acquirers like Cisco Systems and HP are acting like their noses are bleeding, which means nothing has really changed since last week, except for the fact that acquisition talks between IBM and Sun have simply been delayed rather than blown off completely.